Measure accurately, reliably and for a reasonable price. Our specialized staff will thoroughly take you through the entire process. We always start by analyzing your company and your specific needs. Then we recommend the best measurement solution tailored for your company. We will of course handle the delivery and service of the dataloggers. Data Elektronik always focuses on providing the ultimate, complete solution for all our customers. You need to measure something, we give you the solution. We also cooperate with the customers after the purchase. The business does not end after the sale. That is when it begins for us! MadgeTech is known for their wide range of products and applications. Here, we show you only a selection from the portfolio. Keep in mind that whatever it is that you need to monitor, we have the solution for you. Simply contact us and describe your company and measurement needs to us. A state-of-the-art temperature datalogger developed for sterilization validation processes. 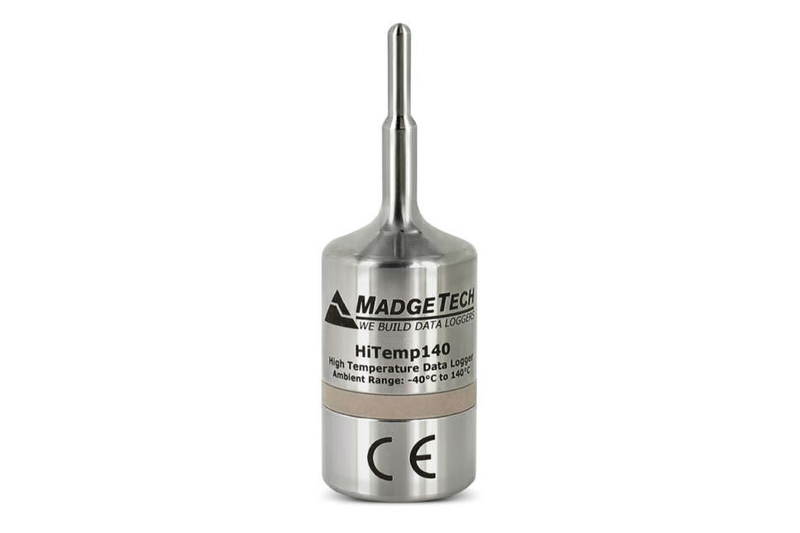 It is rugged, high precision, measures up to 140 °C and is built for use in autoclaves and harsh environments. There are many types of HiTemp140. You can choose from various lenghts, there is a version with 2 external probes and if you are dealing with temperatures above 140 °C, you can always go for our brilliant thermal shield. This datalogger looks harmless. It is only 5 cm long and weights 24 grams. But do not let it fool you. It is a high precision device that has an internal memory for a million recorded values, its battery will last approximately 10 years and it measures temperature with accuracy of ±0,5 °C. It can be placed almost anywhere. Want to continuously monitor temperature in a warehouse, at inaccessible locations or basically anywhere? Great! This is your datalogger. This datalogger is just perfect for anyone in the meat industry. You simply hang it next to the meat product and put the probe inside the meat. Then you sit down to a computer with Wi-Fi and observe measured data in real time. Dealing with meat? You need this datalogger. The accuracy of RFOT is exceptional ±0,1 °C within 0-100 °C range. Aren’t you tired of all the cables? Take a look at this datalogger. It can be mounted on a table or a wall, it has very convenient display and it’s wireless! You will only need a computer with Wi-Fi connection and MadgeTech software installed. Data can be read remotely and can as well be downloaded for future analysis. This is the modern way to monitor temperature. The RFTemp2000A from MadgeTech. Sometimes we need to monitor temperature that is even lower than human body can handle. This datalogger is built for extremely low temperatures, down to -86 °C! With IP64 certification and 2 years battery life, it is the ideal partner for many applications and it is used by worldwide known companies, such as Delta Airlines Cargo. Connect up to 8 thermocouples and monitor 8 measurement points, independently! The OctTemp datalogger is compatible with all the usual thermocouples (J, K, T, E, R, S, B ,N). And if 8 channels are too much, we also offer the 4 channel version. We have more temperature dataloggers for various purposes available. We just think that it would be boring to describe each and every one of them here. Instead, why don’t you tell us all about you and your needs? We will find a solution tailored for your company. Quickly, easily and professionally. I want the price quotation today! MadgeTech, Inc. is an American manufacturer of dataloggers that has been on the market for more than 20 years. They have set the standard for excellence in data logging technology and customer service. Over time, their company has evolved from a one-man operation in a garage to an international leader with products sold in over 100 countries worldwide. Data Elektronik represents MadgeTech in several European countries. Our goal is to make MadgeTech products as available as possible, like if you were in the USA. We always think of the customers as our bosses and we do everything in our power to make their life easier with our professional approach and the ultimate solution in mind. Tell us everything that we need to know about your company. What are you doing? What do you need to measure? Where? How often? What kind of problems have you encountered in the past? Provide as much information as possible to us. That way, we will be able to find the best, most efficient solution for your needs. Please remember to fill all the required fields.